Thanks to the Lunar Terra version, a Hyperfuse camo edition, Engineered Mesh updates, Size’s Safari collabs and even the OG Ultramarines, the Nike Air Max 180 has been all over the place in 2013. Here’s a new style that blends right in with the 1991 originals thanks to its use of two bright accent shades on a white base. 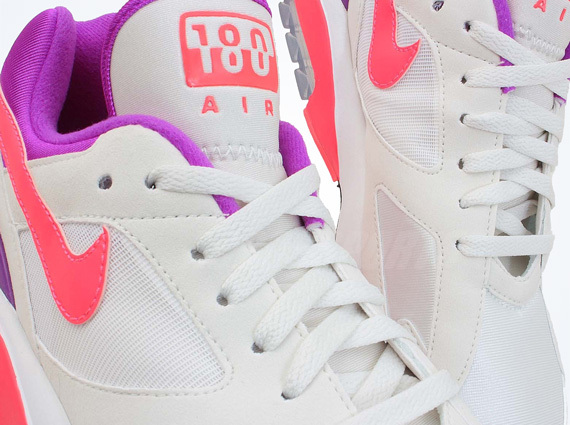 This pair with Laser Crimson and Bright Magenta hits on a Summit White upper is very much the kind of energetic look that epitomizes the early 90s (it is an OG WMNS style, after all), but this pair’s tonal pink/redness and inclusion of ‘Max’ in the title also reflect’s today’s influence. Take a closer look after the jump, then pick it up from ID4shoes on eBay.